Capt. R. D’eate (Jr) of the US National Guard (Pennsylvania) led the team to secure the fallout shelter in 1957. Being an active sort, the 50 years in the shelter took their toll on the young officer’s mental faculties. Now calling himself “Ray D 8”, he has taken to bringing a selection of 19th Century children’s toys to both gigs and the band’s rehearsals. Nobody has had the nerve to mention this, so Ray’s toys are often “used” during performances. 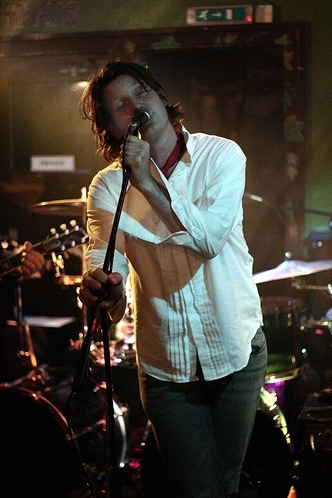 His behaviour has been noted as both odd and “barely this side of acceptable” but in the Rock n’ Roll environment of a Rays gig these “quirks” have been seen to be both “entertaining” and therapeutic for the young officer (who currently believes he lives on the fictional planet of Metaluna). In his early days in The National Guard, Ray played cornet in the Pennsylvania Division’s brass band and occasionally he has been known to “flashback” during gigs to those days with his toy trumpet. This sometimes manifests itself with a harmonica and, when he really loses the plot, a Japanese plastic megaphone. Ray seems perfectly normal while off-stage; his troubled mind only taking control when fronting a seriously rocking band.